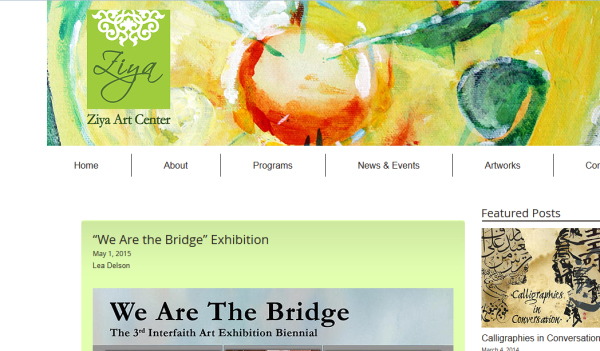 On Saturday, May 2, from 5 to 8 pm at the Islamic Cultural Center of Northern California (ICCNC), the interfaith art exhibition We Are the Bridge will open with a public reception. 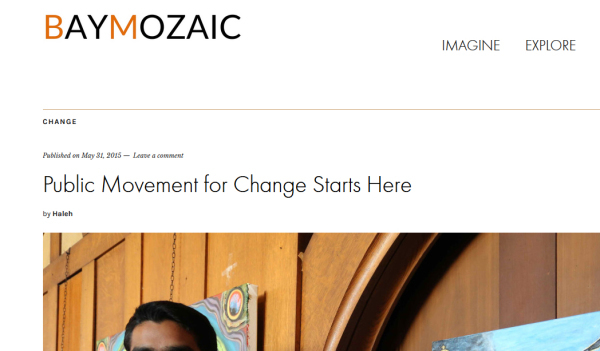 ICCNC is one of three congregations that, along with Kehilla Community Synagogue and Montclair Presbyterian Church, make up the ‘Faith Trio,’ an interfaith initiative that has coordinated this exhibition, and has collaborated on a variety of community-building activities over the past thirteen years. This new interfaith art exhibition presents over 100 artworks, an inspiring and thought-provoking array of arts by a diverse group of artists. The exhibition offers art as bridge from conflict to reconciliation and expresses the common hopes for peace and coexistence held by people of all faiths and creeds, nationalities, cultures and backgrounds. This exhibition follows up on two very successful interfaith art exhibitions sponsored by the Faith Trio in 2011 and 2013. At the opening reception on Saturday, May 2, attendees can view the artwork and meet the artists. Refreshments will be served, and the reception is open to all and is free of charge. The opening reception will feature a performance by ASWAT, presenting a medley of music from a range of Middle Eastern cultures. The exhibition will be open for public viewing on Fridays, Saturdays and Sundays from 10 am to 4 pm May 3rd through May 30th. This exhibition was funded in part with support from the San Francisco Foundation’s FAITHS fund, the Alliance of California Traditional Arts (ACTA) and the East Bay Community Foundation. We Are the Bridge Exhibition, by Lea Delson, on Ziya Art Center website. 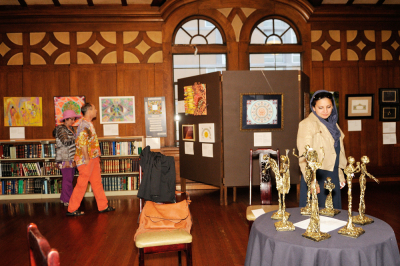 The third Interfaith Art Exhibition Biennial opened on Saturday, May 2, 2015 at the Islamic Cultural Center of Northern California (ICCNC) with an inspiring and beautiful display of artwork. 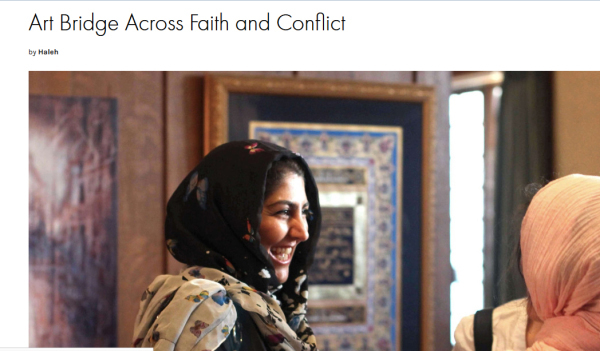 All the artwork reflects the theme of bridge building between faiths as well as building bridges from conflict to resolution and reconciliation. The opening reception was a great success, with about 300 people attending. The opening ceremony featured welcoming remarks from representatives of the three Faith Trio congregations. Raeshma Razvi, Program Development Consultant with ICCNC, was the emcee. Rabbi David Cooper spoke as a representative of Kehilla Community Synagogue, Betsy King spoke as a representative of Montclair Presbyterian Church, and Azita Sayyah, program manager of ICCNC, spoke as a representative of the ICCNC. Arash Shirinbab, Chief Curator, spoke as the head of the interfaith art exhibition Curatorial Panel, and acknowledged the other members of the curatorial committee: Kirk Lumpkin, Lea Delson, Maryam Vesal, Nabeela Sajjad, Rubina Kazi, Steve McKiernan, and Tom Debley. A selection of Arab music by the ensemble Aswat followed. 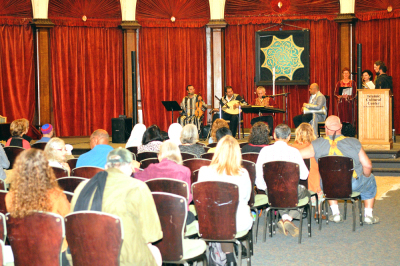 Aswat is a multi-ethnic and multi-racial music ensemble that reaches out to the Bay Area community with folkloric, classical, and contemporary Arabic music. After refreshments, guests had a chance to view over 100 works of art exhibited in the art gallery on the upper floor. Two beautiful rooms displayed a diverse array of artwork, including paintings, photography, calligraphy, quilts, textile art, ceramics, woodwork, metal sculpture and mixed media. Artist and member of Kehilla Leah Korican led an interactive art project for all ages in which outlines of hand images were filled in with words related to peace by participants. 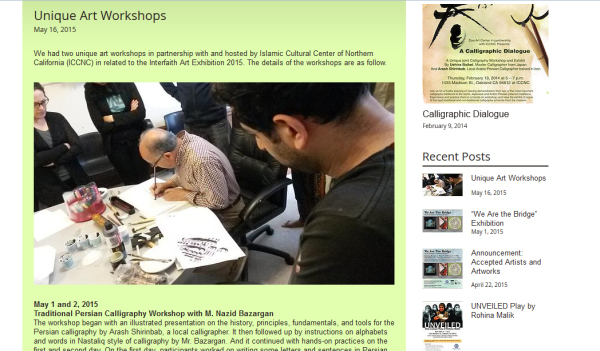 Visitors to the exhibition can add to this piece during the course of the exhibition.